When it comes to the safety of babies and children, we do not mess around. Babies love to explore the world with their mouths so things like wooden toys, baby cradles, cribs, and wooden blocks all will subjected to the child’s curiosity. 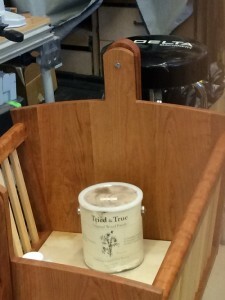 Parents and grandparents really have enough to worry about with their children so we don’t want them to worry about toxic wood finishes.Since Tried & True does not contain solvents, heavy metal driers, or VOC’s, it makes the perfect finish for any wooden object made for and used by children. Jay Cudzilo was kind enough to send us some photos of his project finished with Tried & True. Jay made this baby cradle for his grand-baby. He used one of the Tried & True Danish Oil and three coats of Tried & True Original Wood Finish. Not only did he use a safe and protective finish, the can made an excellent impromptu weight to test the rocking motion!